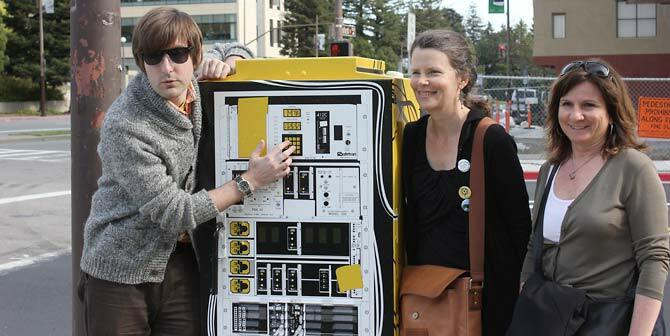 Art on a humble but very public canvas was the theme of a walking tour Tuesday afternoon, which visited seven newly beautified City of Berkeley utility boxes on streets near campus. The works — all by artists affiliated with UC Berkeley and all touching on the idea of “sustainability” — were paid for by the Chancellor’s Community Partnership Fund. “This is my first public art project,” said Robbin Henderson, a ’63 alumna, of her plum-tree paintings gracing a pair of once-gray utility boxes on Oxford Street at Berkeley Way. “Nobody has to intend to see your work. It’s just there” — to be noticed or ignored. Keenan Gravier, a third-year student, depicted local biodiversity for his piece. An architecture major, Gravier said he made careful measurements of his assigned utility box, so that his painting would conform to its unique dimensions when digitally printed on vinyl and attached to the surface. His art opening took place at the busy intersection of Telegraph Avenue and Bancroft Way. The Chancellor’s Community Partnership Fund provided $20,000 for the project, organized by the Earth Island Institute as a way to bring more art and nature to the city streetscape. 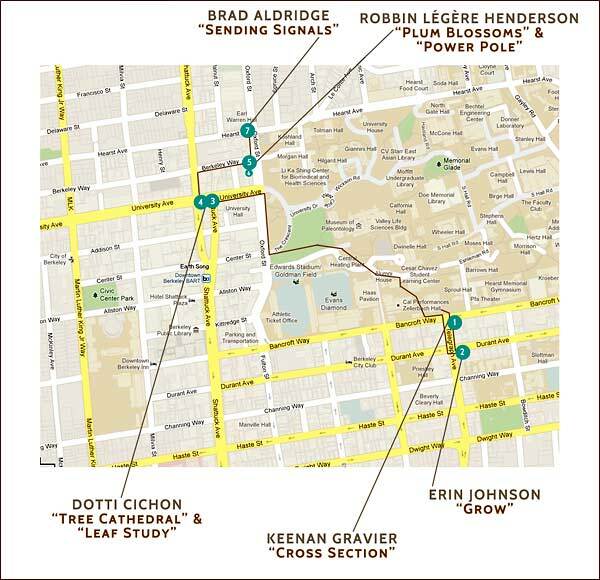 The campus worked in partnership with the City of Berkeley’s Civic Arts Commission to select and approve the art. Representatives of participating organizations were on hand for the art happening — among them Berkeley City Councilmember Jesse Arreguin, staff from the Telegraph Business District Association and the Earth Island Institute, as well Associate Chancellor Linda Williams and representatives from the Office of Sustainability, Capital Projects and the Chancellor’s Community Partnership Fund. A map of the new artworks can be found here. 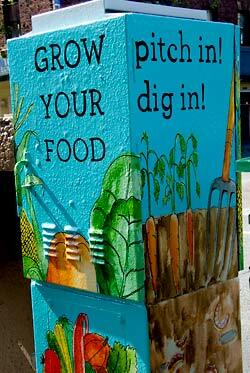 More on the Earth Island Institute’s Streets Alive! initiative can be found here.